1) The President of India has promulgated ordinance for constitution of commercial courts. Transfer of pending suits: All suits, that are yet to reach judgement, of a value of Rs one crore or more that are pending in the high court or district court shall be transferred to the commercial division, after it is constituted. 2) Third Indo-African Summit to be held in New Delhi. The India–Africa Forum Summit is the official platform for the Inida-Africa relations. It was first held New Delhi, India. It was the first such meeting between the heads of state and government of India and 14 countries of Africa chosen by the African Union. Unakoti , situated in North Tripura , hosts finest of rock-cut architecture and stone- images. At the bottom of Unakoti, a beautiful spring descending the hill terraces fills up a cavern, called “Sita Kunda”, having a dip into which is regarded as sacred. Unakoti is believed to have had the influence of the Shiva cult originating from the Pala-era of the mediaeval period of Indian history. 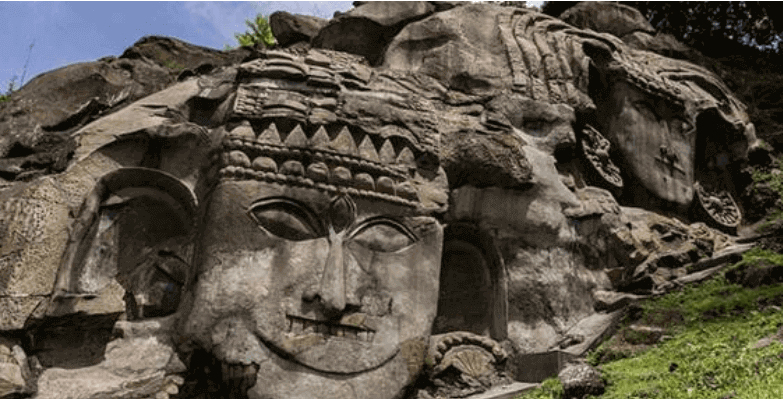 At the same time, the influences of several other cults like Tantric, Shakti, and Hatha yogis are also found to be present around this archaeological wonder. According to the Archaeological Survey of India (ASI),Unakoti dates back to the 8th or 9th century AD. Yet, many others differ with the opinion, conceding that it dates back longer further holding that those images were carved out in different spell of time. Tummalapalle (A.P) uranium mine: Processing plant to be commissioned in 2015-16. DAE Units supply over 23,000 consignments of radiopharmaceuticals to over 150 nuclear medicine centres and hospitals all over India. Vitrified Cesium-137 pencil, First-of-a-kind in the world, developed by BARC by recovery from High Level Waste. First set of 10 pencils delivered for use in Blood Irradiator units produced by BRIT-DAE. Strengthened collaborative involvement with LHC- CERN; process to become an Associate Member of CERN initiated. The programme provides immunization against seven life-threatening diseases (diphtheria, whooping cough, tetanus, polio, tuberculosis, measles and hepatitis B) in the entire country. In addition, vaccination against Heamophilus influenza type B and Japanese Encephalitis is provided in select districts/states. The Ministry of Tourism, Government of India, in association with the North Eastern States and West Bengal has been successfully organising the International Tourism Mart over the last three years in various North Eastern States with the objective of highlighting the tourism potential of the region in the domestic and international markets. This Mart also brings together the tourism business fraternity and entrepreneurs from the eight North Eastern States and West Bengal.